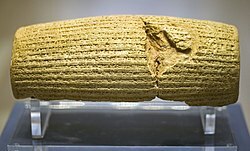 the foundations of mankind’s written language are to be found in Cuniform and one of the earliest examples to survive is the Cyrus Cylinder where at the written word’s outset is defined as all too ‘human’ in their praise of a King and the attempt to define rights – a fascinating insight into our psyche as a genus! The Cuneiform in my collection underpins the belief I have in the written word that is the foundation of my book collection and library – even perhaps my life! The world’s first written declarion of the rights of man are, let us not forget, the product of the peoples of Iran and predate Western Civilisation by a Millenium! Written in Akkadian cuneiform script in the name of the Achaemenid king Cyrus the Great. It dates from the 6th century BC and was discovered in the ruins of Babylon in Mesopotamia (modern Iraq) in 1879 during an archaeological expedition sponsored by The British Museum who still present the incredible artefact for the world. That this document seeks to enshrine in law aspects of Human Rights in an Iranian Monarchy of 2,500 years ago when our Iron Age ancestors were just showing signs of agriculture and wearing woad as they sacrificed each other and had, it seems, no written language nor cohesive governance as a people is a sobering thought! Perhaps it is time that we the peoples of Britain considered the true nature of our own rights and the method of governance of our Country to enshrine our rights and liberties once more with a more ethical and democratic process via a renewed declaration! [When … Mar]duk, king of the whole of heaven and earth, the ……. who, in his …, lays waste his ……. and ordered that he should go to Babylon He had him take the road to Tintir (Babylon), and, like a friend and companion, he walked at his side. may they be the provisioners of our shrines until distant (?) days, and the population of Babylon call blessings on my kingship. I have enabled all the lands to live in peace. [… ……………………………………………………………..with bitum]en and baked brick I built anew, and [completed] its [work]. […………………………………………….] my [… I presented] as a gift…………………] your pleasure forever.